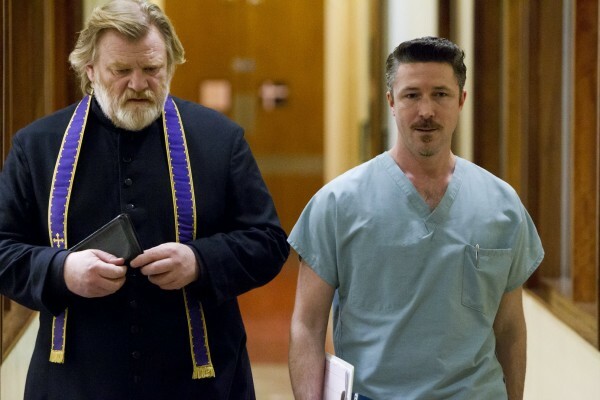 Calvary is the story of Father James, a Catholic priest in rural Ireland, who receives a genuine death threat. The film then follows Father James as he goes about his daily business in the week leading up to his appointment with death. Calvary is a film about people and its focus is Father James, a Catholic priest, a good man and a good priest, innocent of any wrongdoing. A rare gem of a film that explores the richness and complexity of human beings by putting a rural community in Ireland under the microscope. Its twin themes are goodness (contrasted with wrongdoing and sin) and forgiveness, and it explores what it means to genuinely forgive someone who has wronged you. Well worth exploring if you want to reflect on the true meaning of Easter. Calvary has a very dramatic start. In the opening scene, we join Father James (Brendon Gleeson) as he hears confession. A man, who we don’t see, says he was sexually abused as a child over a long period of time by a Catholic priest who is now dead. The man then casually informs Father James of his plan to kill him on the following Sunday. Right from the start we have two mysteries to solve – who is the unseen man, and will he go through with his plan and commit cold-blooded murder? But if you think this film is a murder mystery you would be very wrong. Calvary is a film about people. Its focus is the aforementioned Father, a Catholic, a good man and a good priest, innocent of any wrongdoing. The setting is rural Ireland, and the scenery and landscapes are breathtaking. But although the film is set in Ireland, because its focus is people and the way they interact and behave, the story is a universal one and could take place anywhere. Having received his death threat, we follow him on his rounds, meet his parishioners, learn about their private lives and their deepest darkest secrets, and are given an insight into what drives them and their hopes and ambitions for themselves and their future. I really enjoyed meeting all the characters in the village, including the woman daring to have an extra-marital affair with a black man, the sexually frustrated young man thinking of joining the Army so he could have a legitimate outlet for his anger, the atheist doctor seeing the whole world through a cynical lens, the very wealthy ex-banker seeking atonement for his past financial sins, the pub landlord facing foreclosure and financial ruin, and the elderly writer wanting to die at a time of his own choosing. The village contains a diverse range of complex characters (as all places do). All the actors in the film are excellent and make their characters totally believable. As this is a village in Ireland, there is a real sense of community, and of people living shared lives where they care about each other, look out for each other, and know what is going on in each other’s lives. There are a couple of very enjoyable scenes in the pub where the community comes together to enjoy some music, drinking and dancing. At one time the Catholic Church would have been the beating heart and the centre of this community, but that time is now past. Whilst people still consult the priests, and talk to them about their worries and anxieties, there is a real sense that the answers to their problems lie elsewhere and won’t be found through the Church or religion. Father James is unusual in that he had a life before he joined the priesthood. He is of the world and living in the world. He was married, only joining the priesthood following his wife’s death. And he has a daughter who comes to visit him, seeking a place of refuge. The life he had before he became a priest makes Father James a more sympathetic character, and someone more likely to understand and empathise with the normal day-to-day concerns of his parishioners. The film shows you the man behind the cassock. The Director, John Michael McDonagh, stated that the film’s title Calvary references the burden Father James carries in the week leading up to his appointment with death. I admired and respected the bravery and the dignity with which Father James shouldered this burden in the film. The film has some great dialogue, and its language is rich, poetic and nuanced. As you would expect from a film set in Ireland, the dialogue is sharp and witty and there are some great one-liners. To give you just one example of the poetry of the language, and my own personal favourite, the phrase “Machiavellian chicanery” is used in one of the opening scenes! Two key underlying themes in the film are goodness, contrasted with wrongdoing and sin, and forgiveness. The film explores what makes a good man and looks at people’s sins and the underlying motivations for their wrongdoing, which can range from vengeance, love of money, boredom, sexual frustration, and financial ruin. The film also examines forgiveness in some depth, and looks at how far it is possible for humans to forgive those who have committed the most heinous crimes. In summary, a rare gem of a film that explores the richness and complexity of human beings, by putting a rural community in Ireland under the microscope. It looks at the changing, and diminishing, role of the Church and religion in people’s lives; examines goodness and sin; and explores what it means to genuinely forgive someone who has wronged you. Well worth exploring if you want to reflect on the true meaning of Easter. Calvary is out in cinemas across the UK now.